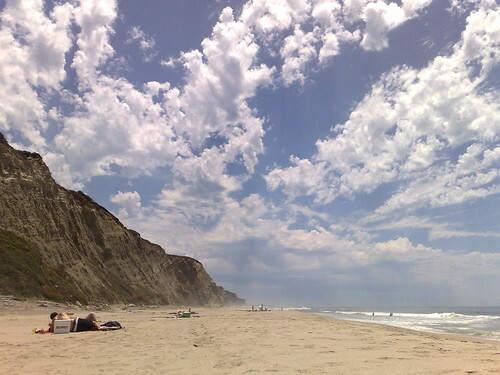 Above: I spent Saturday on San Gregario beach in Half Moon Bay, just a few minutes from the hustle and bustle of busy Silicon Valley, pics from mobile phone. While only 30 minutes from companies like Siebel, Oracle, NetSuite, and Visa in San Mateo, Half Moon bay is a world apart. A short 12 mile jaunt westbound on 92 will take you over the reservoir, which coincidently is in the shape of the fault line (an aerial view indicates it is the fault line) and over the San Mateo hills. You’ll immediately notice a temperature drop and increase in the humid, salt, air as you drive through the eucelpyous groves. In the fall, you’ll see the magic of the pumpkin festival, kids on pony rides, and the various smoked salmon shops and mini-wineries. Half Moon Bay is home to many silicon valley executives, corporate offsites, and rolling beaches. You’ll find the Scobles, Tracy Chapman, Singer/Songwriterand Phil Schiller – Apple Marketing SVP. Head south and you’ll find a handful of public –and private—beaches. In college I took a geology class, and learned all about the very unique sand/rock stratifications and the collision between water and rock to make some of the most dramatic –and beautiful– landscapes. Other notable areas is the famous Mavericks surf, where world class surf competitions take place. There’s a reason why Silicon Valley is one of the most expensive places in the world to live, aside from the thriving technology industry, the quality of life makes it a desirable place not only to work but also to relax.